From some of months my interest was captured to the challenge of receiving some “exotic” signals in the range of ELF – SLF – ULF – VLF frequencies. Connecting an antenna to a PC with a Sound Card and Software like CiaoRadio, it is possible to receive, analyze, and demodulate any ELF – SLF – ULF – VLF signal up to 24 kHz. The antennas at these frequencies are vertically polarized in 99% of the case. The mode of propagation is the Surface Wave where the vertical wave could travel. Every horizontal component is mainly cancelled from the anti-phase reflection of the ground. Horizontal polarization looks to be used only to receive the “seismic precursors“ and the signal coming from the sky wave of the auroras that have random polarizations. Most of these antennas are based on the use of Short Monopoles (with or without capacitive hats) or Small Loops as in Figure 1. Figure 1: Small Loops and short Monopoles used in VLF and ULF receiving stations. Both are typically untuned. The monopoles are typically connected to high impedance amplifiers and the loops are typically connected to low impedance amplifiers as in Figure 2. This allows the antennas to have very large bandwidth behaviour. The problem with the monopoles is that the ground system that recreates the lower part of the dipole is very “fuzzy.” This means that local currents induced from the main at 50 or 60 Hz and harmonics could easily flow into this “undefined” part of the antenna. This reduces the possibility to shield the antenna from these high level fields from the main at 50 or 60 Hz and harmonics. One possible way to avoid this is to use a short vertical balanced dipole as probe. To avoid the use of a balun made with inductive parts that will limit the bandwidth at this frequency, it is possible to use a differential amplifier in the so-called configuration of “Amplifier for Instruments.” The use of Operational Amplifiers allows a high level of peak to peak handling and of intermodulation immunity. This was the road used to develop the ADA (Active Differential Antenna), now in the antenneX archives. This project will now use the same theory to develop the active interface for a Marconi Long Wire antenna. A short monopole (l < 0.1WL) has an effective eight (H) approximately equal to his length (L). The equivalent circuit, connected to the amplifier is shown in Figure 3. Ra , that is. the radiation resistance , is very low and tends toward zero while the frequency is decreasing and is in any case negligible respect to Ri, that is, the input resistance of the amplifier . If we apply the Thevenin transformation, we get the simplest possible circuit showed in Figure 4. 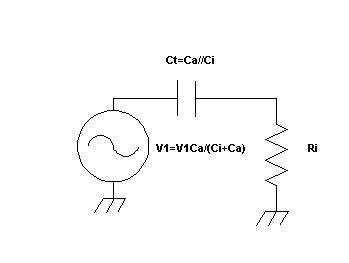 The amplitude of the equivalent generator is decreased from the partition between Ca and Ci, but the equivalent capacitor Ct is the parallel of Ca and Ci. Ri and Ct state the lower frequency Fc. As Ri and Ci increase, the Fc decreases. In this case, we will develop the active interface for a Marconi Long Wire antenna. The three different designs are shown in Figure 5. The Marconi L is sensitive to both vertical and horizontal polarization. The Marconi Ts are sensitive only to vertical polarization due to cancellation of the currents on the horizontal part. In between, we can find the asymmetrical Marconi T, shown in Figure 6. This design is quite the most used because it easily fit in any configuration of ground and house. There are some formulas, but a very practical and quite precise rule of thumb for a wire antenna is to account about 10pF/m for any wire segment length. A practical way to measure the capacitance is to resonate the antenna with a know inductance. I performed this test on the Marconi L antenna of 40 m of total length I built for this use. With an inductor of 650uH I got a resonance at 305 kHz. I measured a capacitance of around 420 pF. Resonance was checked using a variable frequency generator and testing peak of the current with a series transformer and an oscilloscope. 2) The use of a MOSFET in the first stage of the active part, to guarantee high impedance and low noise. Some Operational Amplifiers have bad noise performances when use with high feedback. I used the RFSIMM99 freeware for modelling. First check was simply the lower frequency corner of the amplifier excited from the capacity of the antenna, like shown in Figure 7 and 8. I used an ideal OPA as active component. Figure 7 shows the equivalent circuit and Figure 8 the simulation where we can see the lower corner frequency of 3.7 Hz. At this stage I decided to add at the input a two-pole RC low pass filter to limit the BW. This added a loss of 2.4 dB, but gave an upper corner frequency of 330 Hz and a slope of 12dB/octave. Circuit and simulation are shown in Figures 9 and 10. Figure 11 shows the real circuit of the active high impedance amplifier. The gain was measured to be 12 dB to 10 MHz and 8 dB at 30 MHz. Removing the RC filter shown in the simulation, this allows the system to perform as an active antenna on the entire HF band. Using the RC filter as in the simulation, we have an active antenna for the band 4-300 Hz. It is possible to switch in and out the filter with a double switch. Figure 12 shows the practical tests with the Marconi L Long Wire connected to ground, the passive RC filter, the amplifier and the Sound Card of the PC using the CIAORadio software. 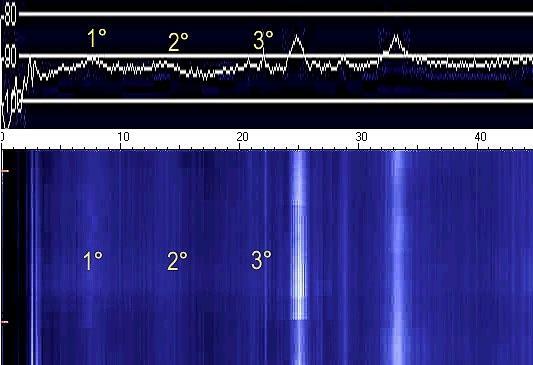 The first three resonances were clearly visible on the spectrum and on the spectrogram. The rise of the noise is due to the lightning exciting the Earth-ionosphere like a spherical cavity. Other peaks at 25 Hz and around 33 Hz are man made pulse modulation of the main at 50 Hz (not shown). By changing the values of the RC circuit or removing it, it is possible to use the antenna from 4Hz to 30 MHz and up! In conjunction with a PC with a Sound Card and the CiaoRadio Software http://www.comsistel.com/Ciao%20Radio.htm one can receive, analyze and demodulate any ELF – SLF – ULF - VLF signal to 24 KHz, like shown in the article of the ADA (Active Differential Antenna) now in the antenneX archives.